Our genealogical research services help you to start or extend your family tree. Whether you are researching a particular line or locality, trying to break down a 'brickwall', or simply looking for someone to do a local look-up, we will be pleased to help. We especially welcome enquiries from researchers and professional genealogists overseas who are looking for a local link or partner for research in Britain's industrial heartland. 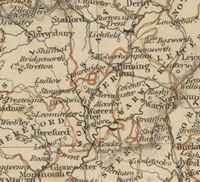 Writing the Past researches mainly in the UK, focusing especially on the six historic counties within the English West Midlands region: Gloucestershire, Herefordshire, Shropshire, Staffordshire, Warwickshire and Worcestershire. We are within easy reach of all the major record offices and repositories in this area and also have access to online databases, archives, documents and indexes. Every assignment is different, from a one-off enquiry to concerted research over an extended period. Please contact us to discuss your requirements. Want to share your discoveries with others? Why not combine research with our writing and/or web design packages to create a full family history solution. See our Family Storybooks section. Having been involved in research and consultancy fields for many years, we know that the secret to a successful project is to get the brief right. We will work closely with you to understand your requirements and specify clear objectives at the outset. It all starts with a free pre-project consultation, either by telephone, Skype or a face-to-face meeting (if necessary and within feasible travelling distance). This will help us to understand how far you have got with your research and what it is you would like us to do. We will then agree a Research Brief: a plan of action with estimated costs. If you are starting from scratch (i.e. you have not looked into your family history before) then we will ask you to complete our Family History Questionnaire. This is a basic checklist of information about your family, which will provide a starting point for our research. Of course, anything that you tell us about your family, or that we discover, will be treated in the strictest confidence. Using the vital clues in the Family History Questionnaire, we will start investigating your family tree. We research mainly in the UK, focusing especially on the six historic counties within the West Midlands region: Gloucestershire, Herefordshire, Shropshire, Staffordshire, Warwickshire and Worcestershire. We are within easy reach of all the major record offices and repositories in these areas and also have access to online databases, archives, documents and indexes. In addition, and where feasible, we can travel to record offices elsewhere within the UK (with expenses payable). If this is not appropriate or cost-effective, we can refer you to suitably qualified genealogists in other regions and/or in specialist fields (e.g. palaeography – the reading of old handwriting). This active research stage is subject to a deposit (generally 50% of the agreed fee). The deposit may be refunded, either in full or in part, if we are unable to make any satisfactory progress against the agreed Research Brief. Any refunds will take into account the time expended (click to download our Terms & Conditions). Now we get to the exciting part – telling you what we have discovered! We can report our findings to you in a variety of formats to suit your needs. Options range from a simple email or a clip-bound report, to a full-colour deluxe book that you can treasure as a family heirloom (see our Family Storybook section). 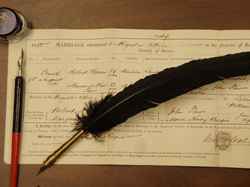 Our standard packages assume that we are tracing your ancestors from scratch, generally from a starting point in the early 20th or late 19th century. If you wish to start with an earlier or later date, please let us know and we can tailor a solution to meet your requirements. All our research packages are subject to a 50% deposit. In addition, we offer a 'pay-as-you-go' option, charged at an hourly rate. This is useful if you have a very specific query, such as a search at a record office within the Midlands area, or you require one-to-one professional advice to get you past a 'brick wall'. This Contract Research option can also be used to carry out research in small stages, keeping control of how much you spend. You set a spending limit (minimum of two hours) and we work up to that limit, only charging for work done. We offer Gift Cards to any value which can be used as payment towards any of our services - family history research, Family Storybooks, or online solutions. See our Payments page for details. What is in the Research Report? Our Research Report describes the brief we agreed with you – the client – and the process we have gone through to meet those objectives. It includes a description of the findings and historical points of interest, such as occupations, plus (for the Gold and Platinum packages) further contextual information on the locality and your ancestors' way of life. Copies or transcripts of all documents consulted are included in appendices. We also provide an assessment of the potential for future research. What will my 'family tree' look like? Our family tree charts are provided as basic printouts to help you visualise the findings. They are printed in black-and-white on A3-sized paper and may have separate sheets joined together. Presentation-style printouts (full-colour on continuous single sheets) can be provided at additional cost. Yes, clients who have previously purchased the Bronze or Silver packages can upgrade to the Gold or Platinum packages simply by paying the difference between the two solutions. What happens if you hit a 'brick wall'? As professional researchers we aim to deliver to your requirements, which is why we devote a lot of attention to specifying and agreeing a Research Brief beforehand. If, for any reason, it is not possible to continue researches due to lack of information or resources not being available, we will discuss any further searches that could be undertaken (e.g. follow a different line). Alternatively, we will refund the balance of the agreed fee. How will I receive the information? We can deliver your final documents on paper or by CD or email. Just tell us how you would like to receive them. All postal deliveries are sent by Royal Mail Second Class – alternate delivery options are available at additional cost.